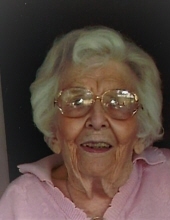 Marion Norma Boyd, 102, of Bardstown, died at 2:30 a.m., Saturday, January 12, 2019 at Flaget Hospital in Bardstown, KY.
Funeral services will be held at 12 Noon on Saturday at Saints Peter & Paul Catholic Church with Rev. Father Richard Meredith officiating. Burial will follow in Riverside Cemetery. Visitation will be from 10:00 a.m. until the funeral hour at the church. Hughart, Beard & Giles Funeral Home is in charge of arrangements. A native of Hopkinsville, Kentucky she was born on September 18, 1916 the daughter of the late Harry J. Boyd and Marion Cousineau Boyd. She lived in Hopkinsville until 2015 before relocating to Bardstown. She owned and operated Norma’s Beauty Salon, was a member of Saints Peter & Paul Catholic Church and volunteered as a Pink Lady at Jennie Stuart Medical Center. She is survived by her nephews: Andy Stratton and his wife Alice of Mayfield, Tony Stratton and his wife Julie of Cincinnati , Tim Stratton and his wife Cindy of Chapel Hill, N.C., Paul Stratton of Pittsboro, N.C., and Roth Stratton and his wife Lisa of Bardstown. There are also many great nieces and nephews as well as great great nieces and nephews. To plant a tree in memory of Marion Norma Boyd, please visit our Tribute Store. "Email Address" would like to share the life celebration of Marion Norma Boyd. Click on the "link" to go to share a favorite memory or leave a condolence message for the family.